Monday is the start of the week in my home. I turn to my handy dandy binder which is kept in a spot on my counter. My daughter loves this book, home to class lists, school permission slips, and more. 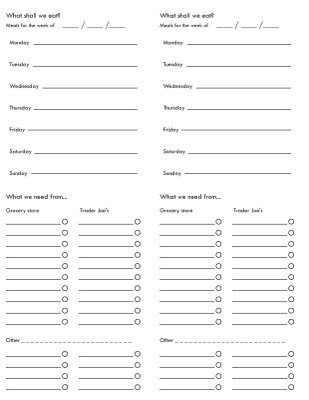 My fave are the Menu planning sheets (courtesy of heart-of-light) which help me to plan my weekly menu. It is fun to look forward to "what we shall eat" for the week ahead. I save recipes in a file for future ideas for the weeks ahead. When you plan, you are better equipped to stick to a budget. I also love stocking the pantry with staples, should the best laid menu plans fail. Shopping seasonally and stocking the pantry with staples is key. I am especially excited since last week I was waiting for the arrival of a new fridge! In my quest or desire to feed my organizational lust, I happened to find this wonderful site here. There are simply super tips to motivate one to organize. I love the Russel and Hazel binders, notes and other aesthetically pleasing items for storage. 1. Prioritize, "eat your veggies first" - then dessert. Do the highest priority first. 2. Say NO, for everything you say YES to, you are saying NO to something else. 3. Balance, strive for a balance. It is like going to a "buffet" and eating too much of everything and walking away not feeling great. Feel good with less, limit the choices and you will find balance. 4. Pick & choose! Life is all about choice. Make a list first thing to begin your day. 5. Order gives light and energy. Learning to plan ahead for a rainy day, or a day without power provides energy and a source of light and contentment for any day of the week. How do you plan ahead to simplify - so you can enjoy your week? What would you say needs the most attention today, what is on your list in order of "highest priority?" Happy Monday, Monday! OMG you are so organized...I wish I could be one, always trying but I always fail miserably. well, it looks that way...but I do have several masterminds that would disagree. They like to "undo"
that is the life of a mom. Today I am going to clean out my box of various stationary, and write someone a letter. I love to receive a note or letter, but as my Mother says "you have to write one to receive one" so will it be pink or blue or monorgrammed or not? I love these kind of fun choices. I think keeping only what we really need and use is key. The more we have, the more we must maintain. I am constantly editing things from our home, just to simplify life. I do think that binder must be terribly handy when there are children still at home. I treat it like an in box, and the things that I need to keep are filed there, it really does help to have a "go to" binder. You can see it on "Russel and Hazel"
I love the binder idea. Having two young boys makes organization at home so much trickier and having a binder would make it so much easier. I agree with Debra's comment. The best way for me to stay organized is to keep clutter to a minimum in the house. one way to stop clutter is to keep a bag or basket discreetly tucked away (or a drawer) and items to donate automatically can be placed in there. I agree, except for saying no... I've been migrating from being a no to moe of a yes. Love the binder. I've been really working on editing things. I don't like clutter so I'm always up for removing....if I could just find the time. Ironic, huh, if I did it....everything would take less time. Love the ballet post! Speaking of ironic, I just posted a little ballet gift this morning. I alway admire and envy your organization. I love the menu planning sheets. Thanks! That drawer is beautiful. Think I may tackle that nasty kid's school supply drawer in the kitchen. It's sooo bad. Thanks for the inspiration. 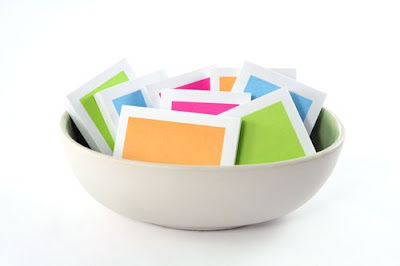 These are great ideas; I especially love the menu plan. When I do take the time to figure out what we will eat for the week, dinner time is so much easier and we save money at the store! Hope you have a great week!! I was not "wired" to be organized. It's one of those things I do because it's necessary. I'm not great at it, but I've learned that some things (like money, time, and laundry) need boundaries if they're going to work for me, not against me. I agree with Debra - less is more. Thanks so much for taking the time to watch "A Walk to Beautiful." Those women still have a hold on my heart. Oh, I love this post. I am always striving to be more organized, better planned, and on and on. Love seeing and hearing others being successful at it and how you do it. Thanks for sharing! I started meal planning as a resolution at the beginning of the year. It has simplified our lives quite a bit and saved us money. Your binder is so very neat and pretty and the its spot on the counter sound pretty darn nice too. I'll have to think abt adding this into the organizational mix. I am painting my baths and yes Patricia, finally behind my bookcases in a luscius coral. The baths are turning buttery yellow, and then periwinkle-gray in the master. I needed a spring jolt of color. Then on to the rest of my list! I need to be more organized. I do give myself permission to not complete everything on the list, though. It takes the stress out of everyday. When I stopped "regular" work I realized that just as the in-box was full when I arrived, it was full when I left... . I love this...it is my goal (not always achieved of course) to live my life pretty much this way. I always spend my Sundays cooking so there's good healthy food for the week ahead, doing my hand washing (sweaters, unmentionables, etc.) so I have clean clothes for the work week and reading so I can get my fill before a busy week begins. Oh, I'm so glad the meal planning sheets are working for you! Anything that keeps me organized while letting me think a little less makes me happy. For your binder! Awaiting the plumber for our new water heater, I assembled a quick calcium rich salad of dark red kidney beans, light mayo, lots of chopped celery and a few chopped pickles for zing. Very yummy and fiberful and calcium rich. Cal-Sal! My binder is bright green! I love that you have a binder where you do your organizing. I've just started carrying a little journal with me everywhere I go to jot down lists (oh, so many lists! ), grocery needs, meal plans, blog ideas.... and so forth. Your posts is leaving me even more inspired to go and organize! Key organizational components in my house - donation box; working calendar/daytime (from Russell+Hazel) that does not leave my sight; bins in mudroom for each family member's shoes/backpacks/sports equipment/etc; file tray with each child's name of it to place papers that need to be read and signed. These things are a must for me and help our house function a little more calmly. Now if I could only get the dog to follow suit! Love how organized you are! I need to print out those meal plan sheets. So cool! Great advice about making a list first off in the day, I need to get better about that myself. Generally I find I get around to that at about noon, and I would be much better off doing it right when I get to work. Wow, I see we all need to prepare for Monday, now that it is Tuesday. Show me your binders and your plans....people! 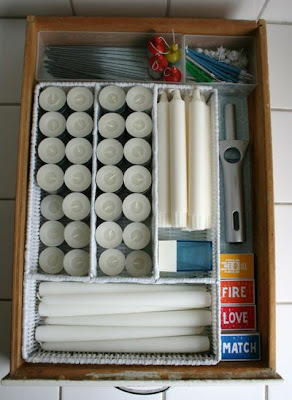 Organization is so much more fun when it's aesthetically pleasing, too. 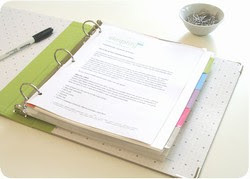 A household binder is a wonderful idea. This is a great post and you're so right about saying no to things once in awhile. I may have to start doing the binder thing, with my oldest starting kindy in the fall I know things with get crazy quick! Patricia - I'm so inspired by those time management tips, since that is my downfall! Wow, I'm impressed with your organization skills. I use lots of "sticky notes" (beautiful colors - bright pinks, greens, blues,) and then I have piles of notes to go through. They end up in my boutique/shop, home, in the car, etc. LOVE the meal planning but this has not worked for me - I'm not much on cooking so we seem to eat out often or I pick up food from Fresh Market or Whole Foods, etc.